Start with 1 scoop to determine stimulant tolerance. Mix 1-2 scoops with 8-10 ounces (250-300 mL) of cold water. CONTAINS 160mg CAFFEINE PER SCOOP. Do not exceed 2 scoops per day. Consume at least 125 fl. oz. of liquid per day for men and 91 fl. oz. of liquid per day for women. DO NOT USE IN COMBINATION WITH CAFFEINE OR ANY STIMULANTS FROM OTHER SOURCES, INCLUDING BUT NOT LIMITED TO COFFEE, TEA, SODA, AND OTHER DIETARY SUPPLEMENTS OR MEDICATIONS. DO NOT USE UNDER EXTREME CONDITIONS OF HEAT, SLEEP DEPRIVATION OR DEHYDRATION. DO NOT COMBINE WITH ALCOHOL. This product is only intended to be consumed by healthy adults 18 years of age or older. Consult with your physician before using this product, especially if you are using any prescription or over the counter medication or if you have any pre-existing medical condition including but not limited to: high or low blood pressure, cardiac arrhythmia, stroke, heart, liver, kidney or thyroid disease, seizure disorder, psychiatric disease, difficulty urinating due to prostate enlargement or if you are taking a MAOI (Monoamine Oxidase Inhibitor) or any other medication. This product contains caffeine and should not be taken by individuals wishing to eliminate this ingredient from their diet. Discontinue use 2 weeks prior to surgery. Discontinueuse and consult your health care professional if you experience any adverse reaction to this product. Do not exceed recommended serving. Do not take if pregnant or nursing. Do not use if safety seal is broken or missing. KEEP OUT OF REACH OF CHILDREN. Citric Acid, Natural & Artificial Flavors, Malic Acid, Silicon Dioxide, Calcium Silicate, Sucralose, Acesulfame Potassium. Citric Acid, Natural & Artificial Flavors, Malic Acid, Silicon Dioxide, Calcium Silicate, Sucralose, Acesulfame Potassium, FD&C Yellow #6. 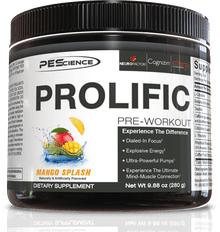 Dec 07, 2016 PES Prolific – PEScience is Back in the Pre Workout game! The long-awaited pre workout supplement from PEScience, finally launched in early 2017! For the most up-to-date information and ingredient analysis on this, see our PES Prolific blog post! Laser Sharp Focus, No Jitters & No Crash! Laser Sharp Focus, No Jitters & No Crash!Laser Sharp Focus, No Jitters & No Crash! PES Prolific is the latest premium pre workout complex from the makers of Alphamine and Select Protein. After countless hours in the lab, the formulators at Physique Enhancing Sciences have put together one of the most powerful, concentrated pre workout powders on the market. Ingredients have been carefully selected to work together to provide a synergistic benefit to all facets of training including power, strength, pump, endurance and mental focus and motivation. Including the exciting Boldine, PES Prolific is designed to bring laser like focus to your workouts, so you can concentrate all your energy into pushing out more reps, and lifting more weight. The result? More volume, more muscle growth and bigger, better results. Take your training to the next level with PES Prolific. Three blends of ingredients to support performance, pump, energy and motivation.